While browsing through the More Treasures from the American Archives collection, a 3-DVD set featuring movies made between 1894 and 1931 that have been preserved by various organizations (including the Museum of Modern Art and the George Eastman collection), I came across a title too intriguing to pass up: The Wonderful Wizard of Oz, a 1910 short that marked the first time L. Frank Baum’s classic tale was ever produced for the screen. Based more on a 1902 stage play than it is the Baum novel, The Wonderful Wizard of Oz introduces us to Dorothy (portrayed by 10-year-old Bebe Daniels), a Kansas farm girl who, after discovering that her family’s scarecrow (Robert Z. Leonard) is alive, is swept up by a tornado and transported to the enchanted land of Oz. Joined by the Scarecrow, as well as such animals as her dog Toto, Hank the mule and a cow named Imogene, Dorothy makes her way through this magical kingdom, meeting such fascinating characters as the Tin Woodsman, a cowardly lion, and Glinda the Good Witch (Olive Cox). Alas, she also encounters Momba (Winifred Greenwod), an evil witch who’s tricked the Wizard of Oz (Hobart Bosworth) into handing his entire kingdom over to her. With nowhere to turn for help, the Wizard issues a decree stating that he’ll give his crown to whoever defeats Momba, a challenge Dorothy and her friends happily accept. The Wonderful Wizard of Oz does feature several elements present in both the novel and the 1939 movie The Wizard of Oz, including Dorothy’s encounter with the rusted Tin Woodsman and her final showdown with the witch. Yet what makes this film so interesting is how it differs from its more famous counterparts. Aside from bringing the scarecrow to life before the action shifts to Oz, this version also abandons such key plot points as Dorothy’s desire to return home (she seems content to stay in Oz forever) and the witch trying to get Dorothy to surrender the ruby slippers. In fact, this witch only wants one thing: to take control of Oz, and it’s up to Dorothy and her pals to stop her. 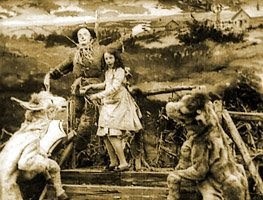 With elaborate set pieces and costumes that, though they appear silly now (especially those worn by Dorothy’s animal companions), were probably quite impressive back in the day, The Wonderful Wizard of Oz is a charming fantasy film that offers fans of the 1939 Hollywood classic a different take on the story they’ve come to love.